So, apparently Tony is really into writing notes right now. The towel note, in addition to the fact that my towel was folded and clean was a bit out of character for Tony, but with that said he regularly leaves me a note on the stovetop when our plans keep us from connecting until later in the evening. 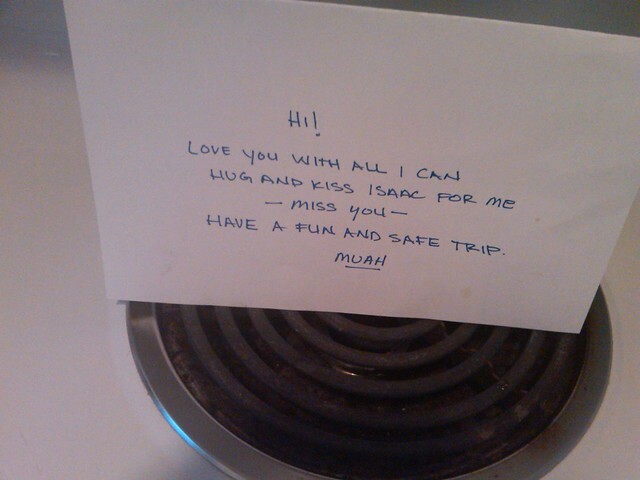 On Friday night, when I made my way into the house after picking up Isaac, I found one of Tony's notes on the stovetop. I "aww'd" and quickly moved on to fixing dinner and getting Isaac situated. 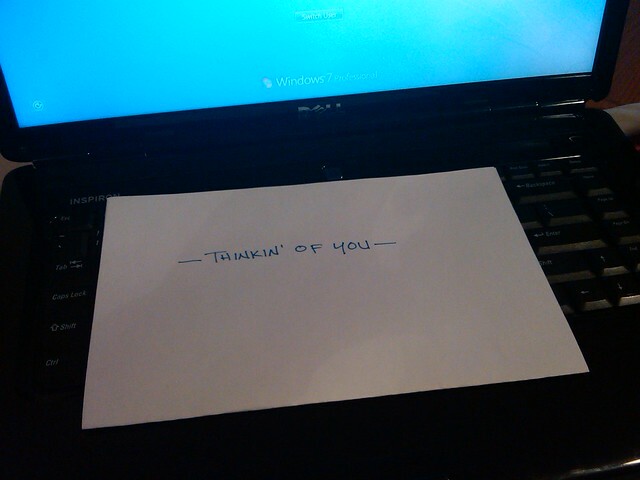 About an hour later, I was completely taken by surprise to find this, when I opened the laptop. I thought it was very sweet, but also the last of the notes. Imagine my surprise to find yet another note in the shower when I went to get ready for bed! Yet again, I thought it was the final note, so I nearly came undone to find this one under my pillow as Isaac and I crawled into bed. Tony was sweet enough to bring up my suitcase for me, so I lugged it upstairs to begin packing. 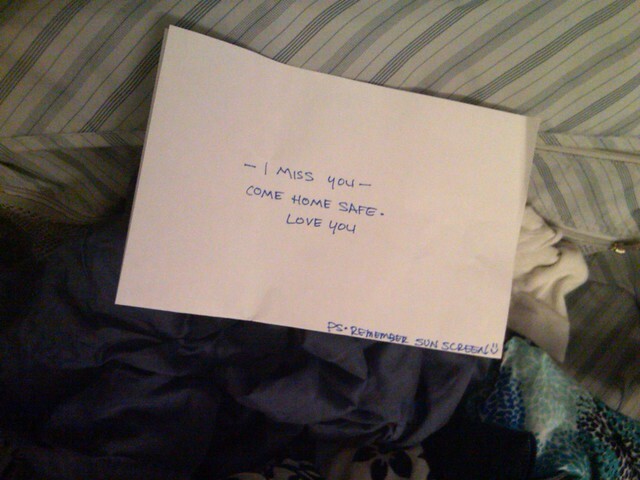 I plopped it on the bed and again was floored to see yet another note! I mean, c'mon!, he was totally killing me with sweetness. I debated for several minutes if I should even bring my camera. I knew that I wouldn't have much time to shoot and it seemed like such a liability to bring along! I finally resolved not too, but in my flurry out the door it seemed natural to grab it. I had plenty of time at the airport and thought I could kill some it snapping away. 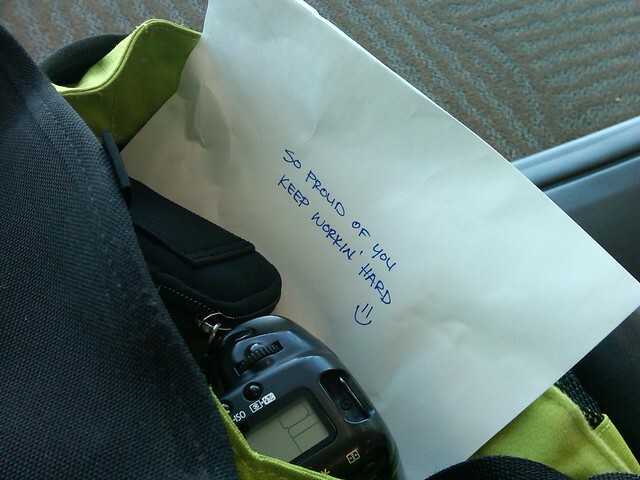 I carried that note with me the whole trip and looked at it often. It's a wondrous thing to know to the core of your being that you are loved, with so many reasons not to be. OMG so sweet! 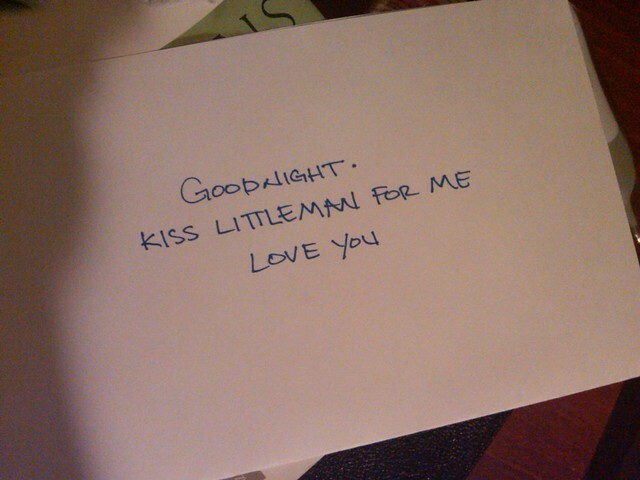 And seriously, can we discuss his impeccable man handwriting? That last one had ME in tears! :) Absolute sweetness. So sweet! Doesn't it make you just melt? I have a note just like those that Nate wrote me the second summer we were dating and stuck in my makeup bag right before I left after a visit with him, so I found it when I went to get ready the next day. That was nine years ago and it's still in my makeup bag to this day. Never ever fails to make me smile when I see it. Awww...that is so sweet...and loving...and I would been in tears! I hope you had a great trip! You are one lucky women Leah! Aw, that is the cutest! Awwwww, I just love surprise love notes from my hubby! My favorite is when I get into my car to go to work and one is setting on my seat. Or the one he left in the refridgerator! oh so cute! and can I just say... Tony has really great handwriting! How incredible! What a sweet and supportive husband you have! That is the cutest ever! I love it. That's awesome. :) What a romantic husband you have! ok. tears here. so glad you had these to help you get through your trip. Wow! I am seriously impressed. Good job Tony! My word, this is SERIOUSLY seriously amazingly cute. LOVE IT! and i love his handwriting! How very sweet of him! I have never see man handwriting that is so...pristine!